I caught just three hours of sleep before I woke up, muggy, to my four alarms at six in the morning and stumbled out the door to make it to Wanchai’s Golden Bauhinia Square. At 8am they would hold a special flag raising ceremony to celebrate National Day, which commemorates the anniversary of the founding of the People’s Republic of China. This square (also nicknamed 金白菜, golden bok choi, for the shape of the flower) is especially symbolic because it’s where the ceremony of the 1997 handover was held. Wanchai was weird – it felt slightly apocalyptic to see just a handful of people walking on the wide streets empty of traffic. However, the raised walkway from the MTR to the Square was full of people, and the McDonald’s where I grabbed a quick breakfast (macaroni and soup with a side of hot milk tea, the breakfast of Hong Kong champions) was packed with young people wearing black shirts. The night before, people had warned against going to demonstrate at the flag-raising ceremony for fear of provoking a fight with the police. Yet in the McDonald’s, people seemed more tired rather than tense. The flag-raising itself was, I thought, pretty uneventful. [See the video here.] The flags of China and Hong Kong were raised, and two helicopters flew two more flags overhead, while a large boat passed by spraying huge jets of water. Later, online, people criticized how the Hong Kong flag was so much smaller than the PRC flag. People booed (here, it’s more of an “Ohhhhh!” that in America might be used to express approval/awe of an especially well-made, biting comment). The whole event took about a minute. A lot of people cleared out afterward because there really wasn’t much anything else to see or do. The ceremony attendees began to exit from the Square and onto Convention Avenue, and suddenly a massive group of people raced from one end of the exit to a space right between the two raised walkways linking the two sides of the street. Bemused, I peered over to see why – it turned out that Joshua Wong (黃之鋒), a 17-year-old leader of Scholarism who’s been featured in numerous media reports since Occupy Hong Kong broke out, was being mobbed by the press. A few photographers even climbed onto the metal barricades to snap his photo. I watched him for a bit. He seemed very confident as he talked with them, yet not arrogant; he pushed his glasses up every now and then as he spoke and gesticulated with his hands. While Wong was being interviewed, a middle-aged man on the walkway opposite me yelled out, “支持梁振英!” (“Support CY Leung!”) People weren’t quite sure what he was yelling at first, but when they figured it out, they treated him as a bit of a joke. “支持梁振英!” he called, waiting for the response. “哦,” the people around me replied (“Oh”). “咁我地返屋企啦” (“Let’s all go home, then”). The man left. 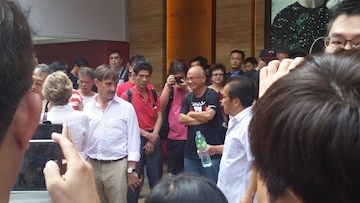 After fielding their questions for a very long time, Wong and some of his friends walked over to a group that was settled on the ground in a circle just on the other side of the barricades. I wasn’t sure if it was a school group or something, but it seemed to be mostly young people who were following and listening to a man in the center who was wearing a shirt with “Captain America” written on the back. Wong didn’t speak, but his friend did; after a while, the group gathered around to put their hands in the middle, shout some words, then lift hands and break. Meanwhile, the stream of flag-raising ceremony attendees continued to exit. Most were middle-aged or elderly, the majority wearing bright red baseball caps. Many waved red flags, some with the Hong Kong flag bearing a white orchid, and others with the PRC five star flag. A few carried them together. It seemed like they all very much enjoyed their day. I tried to hear if they were speaking Putonghua or Cantonese (such a stereotypical and crude method of sorting out “mainlanders” from “Hong Kong people,” I know) but heard a mix. I finally left, intending to go home and sleep. But then I realized that Causeway Bay was just another subway stop over, and I hadn’t been to see that occupation yet, so I popped on over. Causeway Bay is another huge shopping destination, on par with Tsim Sha Tsui. The first thing I noticed was that a truck had come to pick up the masses of trash bags that were piling up, which I was very happy about. I was worried that by closing down the streets, protesters would give themselves a massive trash problem that would possibly cramp their demonstrations. The streets were not too packed, but many people were still sleeping on the ground. Huge piles of food and water were stacked up, ready to last for a long time. Numerous posters and signs were strung along the sidewalks, and I stopped to check them out. There were tons of Indonesian domestic workers standing and sitting around as well, so I stopped to ask a few what they thought. One said she wasn’t affected because the protests were for Hong Kong people. Another said that they supported it. Another woman I spoke with was carrying several sets of prayer beads and books, and she spoke more Cantonese than English. I greeted her with “Assalamu alaikum,” and she told me about her prayer beads. When I’m not happy, she said, I do my prayers and I feel better. She demonstrated, running her fingers one at a time over the beads and reciting the names of Allah. She said she wasn’t sure about the government issues in Hong Kong, but that she knew they weren’t that good, and that there were lots of problems between the mainland and Hong Kong. I walked farther toward Times Square and passed by the Apple store, where numerous people had set up suitcases and stacks of iPhone 6 for sale. A crowd had also gathered outside the store. Suddenly there was loud applause, so I looked to see what was happening – the Apple store had opened. Several other streets were empty of traffic, but occupied with tourists and shoppers. National Day is a huge draw for mainland tourists to Hong Kong. I still meant to go home and sleep, but Henry texted so I went over to Mong Kok to grab second breakfast with him there. Mong Kok looked much the same as before, but with slightly fewer people, so it was more breathable. There I spoke with another Indonesian worker who said she didn’t really know about Hong Kong politics. We also saw a crowd of people following a man in a grey suit with a red name tag around his neck. A few people were holding out their arms and asking people to disperse, apparently to keep any arguments from breaking out. He was apparently some Communist Party representative or something, and he walked to a spot underneath the shady tarps to speak. This, I supposed, was the 2-minute public speaking platform where all people were allowed to speak. This man drew an especially large crowd. We couldn’t quite hear him, so we walked on. After some excellent 皮蛋粒瘦肉粥 at a place highly rated by OpenRice (Hong Kong’s Yelp), we figured we’d go to Tsim Sha Tsui to see what things were like there. 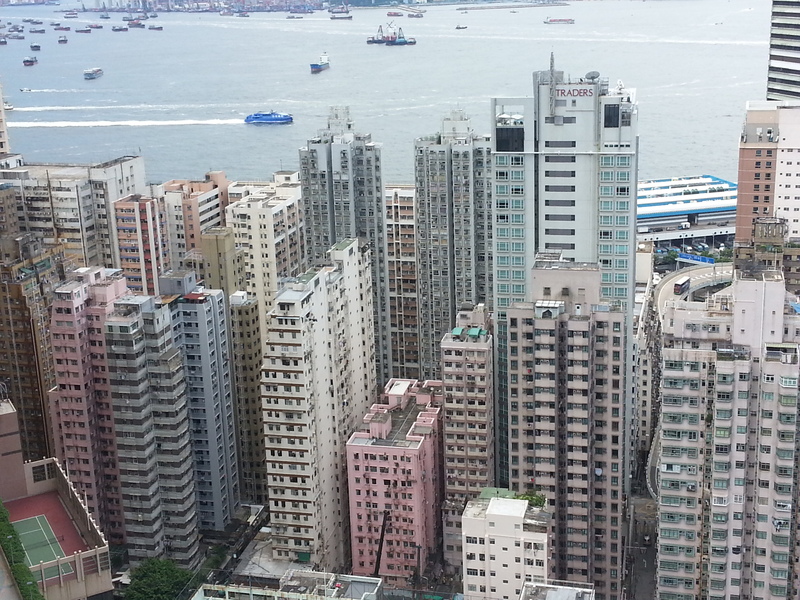 I wondered if its proximity to the Kowloon Mosque might have any impact, but there was none. The crowd was relatively small, and plenty of shoppers and tourists were around. Only a minute section of the street was really packed. “自己香港自己救 自己政府自己管 自己高官自己[?] 自己_自己_ 622 . 71” (“We’ll save our HK. We’ll manage our government. We’ll [?] our officials. We’ll _ our _.”) The numbers refer to June 22, one of the days when the Pop Vote was held, and to July 1, the annual protest march. There was an altercation while we were there between a man and the crowd. I don’t recall what he was yelling, but at one point he got in the face of a tourist couple, and the wife turned her back in embarrassment while the husband watched bemusedly, then disapprovingly, at the man yell at him in Cantonese. Everyone took photos, including me. Finally I went home, intending to rest a bit before meeting up with a few Fulbright English Teaching Assistants at Repulse Bay Beach. While at home Henry reminded me that although the National Day fireworks, usually the big event, were cancelled because of the protests, there was still a festival of sorts in Victoria Park, so of course I had to go. After having seen Occupy Hong Kong, the turnout at Victoria Park was pitifully small. It seemed to be elderly and families for the most part. The aspect I had the most interest in was a “Hong Kong Nostalgia zone,” which was essentially a small cardboard recreation of old Hong Kong shops. Another area had an exhibit – attended by about three people – of China’s achievements in science, technology, economics, and so on. What I found most interesting was how the rickshaw appeared several times as a symbol of nostalgia and fun, although I would’ve thought – this being a celebration of China and its success in liberating Hong Kong from imperial Britain – that the denigration of poor Chinese workers would not have been so fondly nostalgic. I never made it out to Repulse Bay – there were only a handful of bus routes going from Victoria Park to there, in addition to it being a holiday with most of those routes off. I caught a bus down to Causeway Bay, hoping to make a change there to get down to the beach, but I’d forgotten about the occupation there and again couldn’t find any buses that would take me to the south of the island. So I ended up going home and giving myself the rest of the day off for my holiday. On the bus home, I noticed a band parading down the street and saw the long train of marchers sported blue t-shirts with Falun Gong on the back. On Twitter I found out that they had argued earlier with the demonstrators over wanting to march in areas that they had blocked off, but I guess they’d found a compromise and managed to continue marching. I’m compiling a few links and stories here that I think are important. The online aspect of the movement is definitely something I can’t ignore – I never thought I’d be spending so much time on Twitter and Facebook! Badcanto, from what I’ve seen, has some strong and interesting opinions that run counter to many of the predominant themes of the protest. Which is fine – opinions exist on all ends of the spectrum – but this one made me angry. Say what you will about a person’s politics, point out a person’s biases, but there’s no need to be sexist in the process. “What’s so special about her?” includes that she’s pregnant, as if it was another point against her for being a reproducing woman. Even more disturbing, replying Tweets thank Badcanto for the warning and say, “But if she’s still pregnant, honestly safer for her to go home anyways. Crowded.” Another says, “Let me guess, she wants to pump her kid out in HK so it has citizenship.” First – pregnant women can still work and should have the right to continue working; having a baby does not mean that a woman must be quarantined in bed. My high school Spanish teacher was heavily pregnant and still danced salsa on a stage to the tremendous applause of the whole school. Second – the comment about citizenship also touches on such a difficult mainland-HK tension, but leaving that alone, the tone of it completely dehumanizes her and other mainland women as robotic baby-makers. Not okay. The Chinese Communist Party has published an editorial in the People’s Daily (人民日報) that lots of newspapers are comparing to an editorial they published shortly before the crackdown in Tiananmen occurred. Check out the English translation here and the Chinese original here. “Occupy Central” will have negative consequences for Hong Kong and all its people. If it continues, these consequences will be unimaginable. The Wall Street Journal has written on Taiwan’s attitude toward the Hong Kong protests, and a leader of the Taiwanese Sunflower Movement has also written a response to the Occupy Hong Kong protests. […] over the past several days, many friends from Hong Kong have told me that they believe “Today’s Hong Kong, today’s Taiwan” is a more suitable slogan. That is because the relationship between Taiwan and Hong Kong is close, and our respective plights are linked. 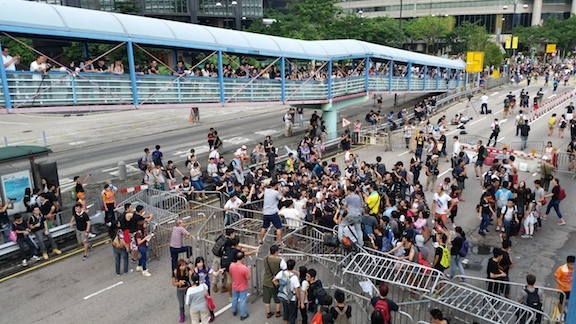 Here’s a very interesting article on why “China is Hong Kong’s future – not its enemy”. This perspective is something that I’ve seen lacking in most other coverage of Hong Kong.